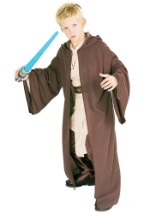 Relive Episode I in this kids deluxe Qui-Gon Jinn costume! Feel just like a Jedi Master in the costume's multi-layer woven tunic and matching brown pants. The pants have an elastic waistband for a secure and comfortable fit and have attached boot covers. A waist sash and 3D rubber belt wrap around the waist with Velcro for a complete look. 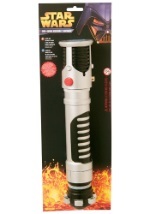 Grab a Jedi lightsaber to complete this Star Wars costume.